I write this on a Google Chromebook while flying to San Francisco on Virgin America. I am happy that the Google is trying out this concept, but it is on the wrong side of technology and its not what I want. The key issue is that storage is really inexpensive and getting more so. My three year old phone has 16GB os space. My iPad has 64GB. The Macbook Air I covet has, well, who knows? Removing the storage from the device solves a non-problem by introducing serious new problems. I don’t get it. My laptop (yes, a Macbook Pro) has a 500 GB drive. When I am disconnected, I can write, I can read, I can watch the movie backlog, I can program. I can learn. I can tag photos. I can do quite a lot. I have pretty much my entire working set with me. There are a couple of terabytes of other stuff laying around at home, but I don’t need that very often. The pressing problem with mobile devices is power, not storage. Why replace a low power storage device, that has predictable and good performance, with a slow, unreliable, communications channel that has a variable cost structure? There are important roles for cloud storage: backup, search, bulk processing, but it doesn’t make sense to move active storage to the other side of a high latency low bandwidth channel. Let’s imagine that the communications is actually reliable and has zero variable costs for a moment. But it still has, say 40 millisecond latency and a megabit or so bandwidth. This is going to work file for email, chat, and so forth. But it cannot be a good video editor, or image browser. I’ve had the experience of using Aperture to browse a few thousand photos on a local SSD. It is a surreal experience – the closest we’ve yet come to Minority Report. The chromebook is a decent effort. I like the keyboard. The screen is nice, the weight is nice, the battery life is nice, but the lack of storage and a real local filesystem is just silly. I have started a new job a couple of months ago, working part time at Quanta Research Cambridge. I’ll say more about that later, but this post is about bicycles. My new boss, Steve Heller, mentioned that one could park in downtown Lexington MA for two dollars a day, and take the bike path to Cambridge. From Lexington to the Alewife T station in Cambridge is about 6.5 miles, along a very nice bike trail, then it another 3.5 miles to Kendall Square, part path to Davis Square, and then down Hampshire Street. This is a very fun ride, inbound is slightly downhill, 200 feet over 10 miles, with no particular hills. Outbound is a little uphill, and mostly upwind in the afternoon, but fun. Now there is another fellow at the lab, Willie Walker, who sometimes bicycle commutes in from New Hampshire, and that is a different matter altogether. For some reason I thought he lived in the Western suburbs somewhere, so I thought I would try biking in from Wayland to Cambridge, which is about 18 miles each way. I am not certain of the best route for this, but so far I take Route 20 to the old Boston Post Road to Weston center (4.4 miles) then Church Street up to 117, and 117 back to Route 20 in Waltham. Just past Prospect Park there is the Blue Heron trail that runs along the Charles River, from Waltham to Newton Corner. From there you can go on the south side of the river along Nonantum Road to the Soldiers Field area, or you can go on Charles River Road and Greenough Drive along the North side of the river. Both have bike lanes, although Nonantum is under construction. At JFK Drive, I head in towards Harvard Square, but turn right on Mt Auburn Street and follow it to Central Square, then take Bishop Allen, Ellis, Harvard, and whatever else seems handy over to the office at 1 Kendall Square. Inbound is easier than outbound, the Waltham hills are steeper on the East side, it is hotter in the afternoon, and still upwind. I now look forward to this and try to do it twice a week. When I can also do the Lexington route once a week I am a happy boy with another 100 miles. It should be straightforward to beat my old SiCortex bicycling goals of 1000 miles a year. But remember Will? As of mid July, he’s already at 4000 miles for the year. 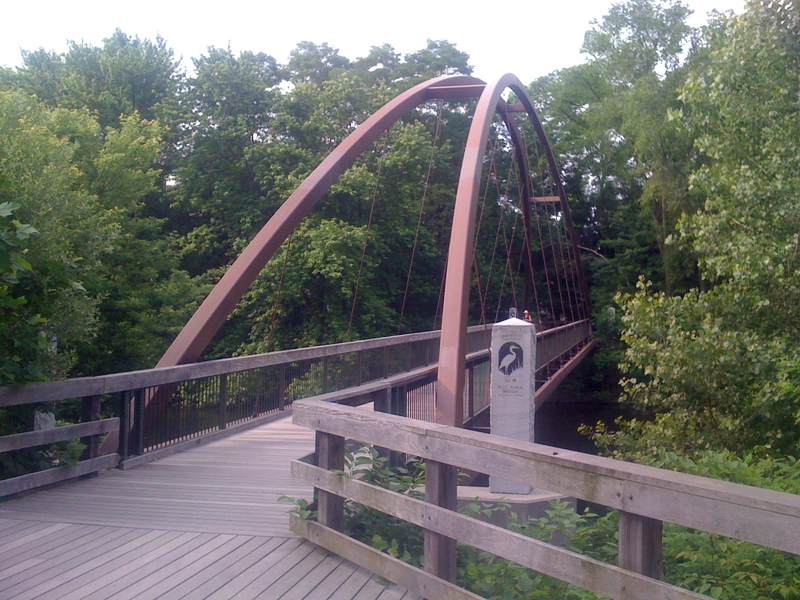 Oh yes, along the Blue Heron trail, about a mile and a bit from the Western end, is this beautiful bicycle and pedestrian bridge.